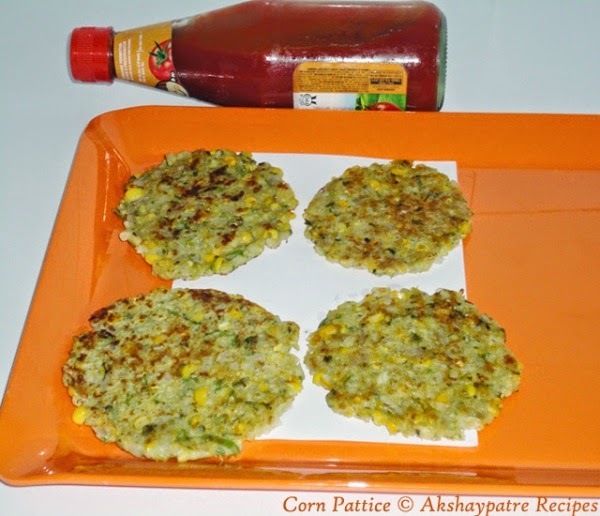 Sweet corn patties recipe - Today I am posting the recipe of corn patties. Fresh corns and rice flour are used as main ingredients to make these patties. Deep fried pakodas can also be made using the same ingredients. But the motive behind making the patties instead of deep fried snack is to avoid excessive oil. 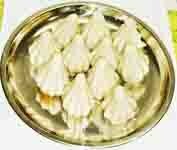 This is a healthy evening tea time snack, usually served with chutneys. Grate the fresh corn on the cob in a large plate. Mix the grated corns and other ingredients and make a thick batter, using little bit of water. Keep it aside for 10 minutes. Heat a griddle and apply some oil over it. Put a orange sized portion of batter on griddle and flatten it using the palm of your hand. Make small sized 3-4 patties at a time and shallow fry till they are golden brown in colour from all sides. Remove from the griddle. 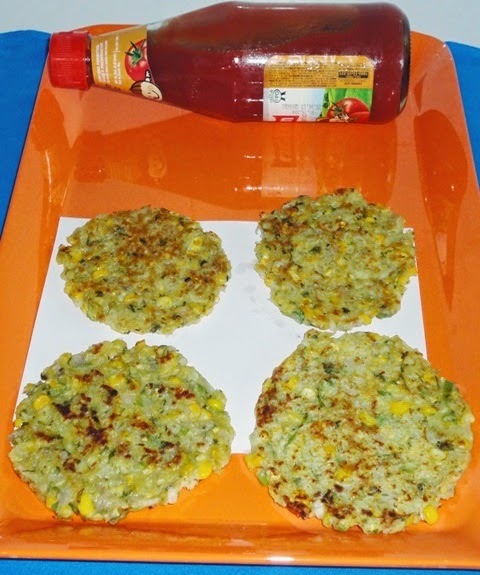 Serve the corn patties or cutlet hot with chutneys and tomato ketchup. 1. Grate the fresh corn on the cob in a large plate. Mix the grated corns and other ingredients and make a thick batter, using little bit of water. Keep it aside for 10 minutes. 2. Heat a griddle and apply some oil over it. Put a orange sized portion of batter on griddle and flatten it using the palm of your hand. 3. Make small sized 3-4 patties at a time and shallow fry till they are golden brown in colour from all sides. Remove from the griddle. 4. Serve the corn patties or cutlet hot with chutneys and tomato ketchup. healthy patties n tempting really. hmmm..my fav...love to munch one right now. I love it. very healthy and yummy..perfectly done.